Valcucine has been a leading company in the kitchen furniture industry for over thirty years, dedicating particular attention to innovation, wellness and durability. Every kitchen is designed focusing on the individual and his wellbeing, with the intention to create products that contribute to increase the pleasures of daily life, with a special eye on sustainability. Valcucine promotes both a balance between use and restoration of environmental resources and raw materials saving, supporting a design approach based on dematerialisation, recyclability, and emissions reduction guaranteeing products durability. Milan is the undisputed capital of design thanks to the Salone del Mobile, the Fuorisalone and to all the Italian companies taking part to these occasions. The high concentration of events and the range of proposals both in terms of products and of initiatives are an important international phenomenon; a record that many cities in the world envy us and have tried to steal us in the last few years. Outside and inside the Salone we find different types of visitors: at the Salone there are mainly professionals, while the Fuorisalone is usually visited by students, architects and people who just want to have a look around. In the night these two communities flow together into one big party. There have been many different key moments in the evolution of Valcucine at the Fuorisalone, the first period in Zona Tortona in the mid-2000s with the events at Superstudio. Among the most significant initiatives there was the awareness-raising, guerrilla marketing event targeting the design community in favour of sustainability and wellness in the hub of the design week: How much does it weight? was a new approach for us, a new way of communicating and raising people’s awareness. Another crucial moment was the opening of our new showroom in Brera, coinciding with the birth of the Brera Design District. Valcucine has always been a content sponsor offering high-quality events in which the experience and participation of the public was very active: inlay artists, woodcarvers, mosaicists in the showroom of Being Valcucine, the makers of Kitchen Becomes Open, just to mention a few. Last year we had a different approach with Tempting Art, an installation dedicated to Expo2015 and to food, curated by Maurizio Galante and Tal Lancman that involved important international art, design and fashion signatures such as Yayoi Kusama, Gaetano Pesce, Angela Missoni, Jean-Michel Wilmotte and many others. The showroom houses many different activities, private events with the sales network and moments of conviviality apart from those dedicated to business. At the same time the company has always proposed content events involving many participants to express the values of the brand. 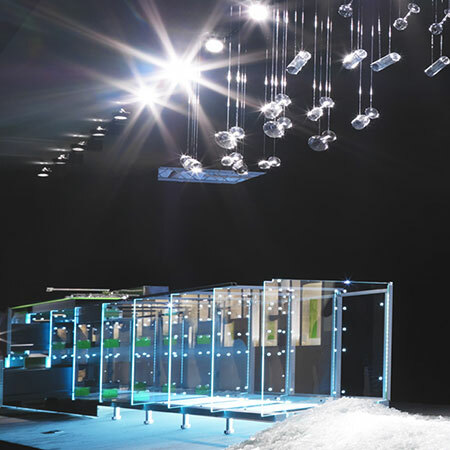 This edition of the design week will be marked by the coincidence of the Salone del Mobile with Eurocucina. We expect to receive interested and enthusiastic visitors, a good turnout and a lot of curiosity because it will be the first real participation of Valcucine in the event after the acquisition of ItalianCreationGroup and the presentation of the new corporate image. The public has not changed much, what has changed is the areas and proposals in Milan. Many new areas have emerged, especially those with showrooms like Brera, others instead have gone through a management and creative crisis.